Konami's classic shoot 'em up may be about to blast it's way onto the Wii U and/or the 3DS eShop in the West, if a recent rating by the OFLC is anything to go by. 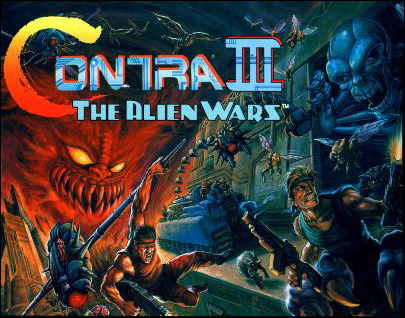 Contra III: The Alien Wars, or Super Probotector: Alien Rebels as it's known in PAL regions, was rated on 11th September, indicating that further Virtual Console releases may be on the horizon. Contra III was re-released on the Wii Virtual Console back in 2007, while its predecessor Super C has also been released worldwide on the 3DS platform. It would seem Nintendo (it's listed as publisher in the rating) is offering the chance to download the shooter once again. Does a potential Wii U or 3DS release interest you? It's one of the Super Famicom's best games so it should interest everyone! The name they gave it in Europe was hideous though. Why would it come to 3DS? Great game! Still own it on Snes. I'd prefer the Super Probotector version (as on Wii VC) as that's what I remember from going round my mate's house and playing it on his SNES. Problem is, I'd also like it 60Hz NTSC optimised, and it's not possible to have both! I wonder how they'll handle the European release? My Probotector cartridge is actually still in my SNES in my bedroom. @Le_Gazman It's not just the name that's different between Super Probotector and Contra III. One has robots and one has men. I remember it well. Pointless! Something to do with Contra being a naughty word for gineyflaps somewhere in Europe I think. Contra III was way better game and better refresh rate than super probotector. I hope we get the 60hz contra release in Europe. Further SNES Konami games would also be ace. I would day one purchase a Wii U Contra III. No interest in a 3DS release. @Le_Gazman I assume they feared the name "Contra" would be associated with the guerilla wars in Nicaragua. That's what I can gleam from Wikipedia anyway. But you're right - it is a hideous name. Cool. When are we going to get games that haven't already been released on the Wii Virtual console in Europe. I'm talking about Uncharted Waters. I want Uncharted Waters. ROTHK IV was a nice surprise - surely they can do the same with Uncharted Waters. PLEASE come out for the 3DS. I need portable SNES games in my life. But watch, it'll be a Wii U game. So both sequels have now been released across multiple consoles, yet the original still remains unrelased?!?!?!? PLEASE NINTENDO AND KONAMI, release the original Contra on VC!!!!! I will not download the other games in the series until I have that game. I also remember Castlevainia Bloodlines being heavily censored as well, it's not surprising that importing was so popular back in those days.. This was a frequent rental for me as a kid. Glad to see that VC is starting to build up a collection of games I want. Best Contra game in the series & one of the best SNES games of all time!!! Since Konami own Hudson now, perhaps they can get their asses on gear with Turbografx/PC Engine support for the 3DS and Wii U VCs? Don't deny us that goldmine that Hudson gave us on the Wii VC Konami!!! I love Contra 3, but I want it on the 3DS!!! Still waiting for Contra NES. I've never played a Contra game so when this comes out I'll get it along with Super C. YES!!! Best Contra by leagues. A 3DS remake would be pimp! (Basically a case of American blatantly supporting really evil terrorists). As always i hope us Europeans will get the 6o Hz version of the game. It's great whenever i can finally experience a game closer to what it was intented to be. Also recently after playing Super C on Contra 4 and going back to our European Probotector version on the NES the latter felt much more like meditation to me. If they start putting Super Nintendo games on the 3DS eshop, that would be awesome! It's got the right button placements for it and can surely support the graphics. They should include the Konami Code this time around that was in the original SNES cart (that game was a TOUGH one but an all-time classic). I'll be upgrading the Wii VC version when this releases. They should release Contra: Hard Corps. And Castlevania: Bloodlines, for that matter. @manu0: I thought the same thing considering it's a SNES game. I already have the GBA version. Why 3DS? It doesn't make sense since there isn't a SNES VC on 3DS. Konami isn't bothered about Nintendo any longer. Broke the agreement for TG16 VC on 3DS as well. @beatalLiToaD I haven't played Super Metroid on Wii U because I can't stand those stupid French/German subtitles WHICH ARE BIGGER THAN THE ENGLISH ONES! Ideally in this day and age you should be able to pick which region's version you want to play. Except for those that own a 3DS but not a Wii nor Wii U, I still don't understand why people would want to buy console games for their handheld. I just realized something - Contra III also came out for the Game Boy. Maybe they're going to release the SNES version on the WiiU and the GB version for the 3DS? I absolutely love this game to bits. Tight controls, addictive music and hard difficulty. First day buy for me, but I want it on the 3DS.